Buddy-cop representations in film are passé. Though gender and racial variations have increased in more recent representations of the genre, the core of the trope is rooted in a duo of civil servants who complement one another. In the case of Rush Hour, both cops belong to marginalized racial groups and Jackie Chan’s intensely dutiful character is juxtaposed with Chris Tucker’s more humorous one. The original aim of these works was to establish policing as just a profession and to humanize cops, turning them into allies of the disenfranchised. Yet, what these works overlook is that the role of the police is to maintain capitalist interests over exploited groups. Newer examples of the buddy-cop genre show an uneven development of the established police characters. Often, cops are shown as fundamentally unpredictable and with strong anti-establishment values, solving cases by any means necessary. Such values, however, never challenge the violence implicit in policing; they simply show a different form of it. 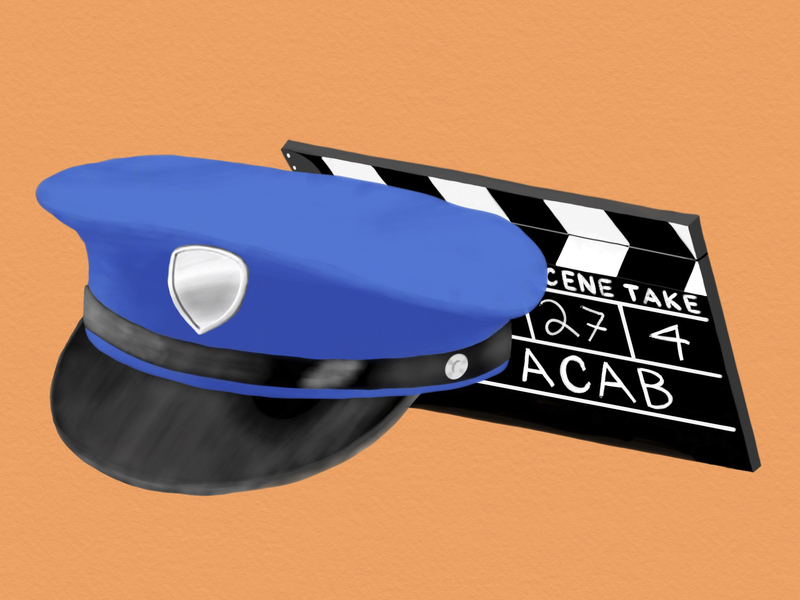 In the last year, two new cop films attempted to frame police officers in a different way. These are Spike Lee’s BlacKkKlansman and the Netflix-produced adaptation of the Indian novel Sacred Games, both of which are centered on “minority infiltrations.” BlacKkKlansman’s Ron Stallworth, for example, is the only Black person in the Colorado Springs police department. Similarly, in Sacred Games, Sartaj Singh is a Sikh man investigating religiously-motivated violence enacted by Hindus on Muslims in Mumbai. In both cases, cops use non-government sanctioned means to infiltrate their respective violent groups. In the case of Stallworth, that group is the KKK, while Singh makes his way into the world of the Hindu gangster Ganesh Gaitonde. Gaitonde’s group, as it becomes clear over time, has been actively propagating and profiting from the armed conflict between Hindus and Muslims. What does it mean for these two movies to place cops against violent groups when it is the police who enable such groups to practice their violent ideologies in the first place? Upon release, BlacKkKlansman generated a lot of discussion. Boots Riley, director of Sorry to Bother You, wrote a particularly poignant critique of Lee’s directorial choices. In it, Riley says that “for Spike to come out with a movie where [the] Black cop and his counterparts look like allies in the fight against racism is really disappointing.” To Riley, Lee’s film hides an essential truth about the police – that, by nature of their profession, those in uniforms are, and have been, oppressors of minorities regardless of their own race. In Sacred Games, this rings true insofar as the fact that the Indian state has always discriminated against Sikh people, a group to which Singh belongs. The state most notably acted as an enemy to Sikhs in the 1984 anti-Sikh riots, which took place in New Delhi and led to the deaths of at least 3,000 people according to “official estimates.” Based on investigations by the Central Bureau of Investigation of India, the riots were aided and abetted by Delhi police and the government. Film representations of cops in the past have either presented them as fundamentally “good” or “bad” characters. They were either depicted as unusually corrupt, as in the Bollywood films Ardh Satya and A Wednesday. In A Wednesday, a middle-aged man sets out to kill the terrorists responsible for bombing Mumbai’s train network because he feels the police system does not understand the “common man” or “his anger.” When depicted as “good,” on the other hand, cops are still distinctly different from people outside of the police network. In such cases, they are saviours who easily notice suspicious activity and act in larger-than-life ways to protect the status quo. Sacred Games brings these two strands together. Here, cops are completely corrupt and the structure of policing is doubtlessly evil. However, this evil is no different from the state of affairs in the outside world depicted in the film. Both the cops and the outside world, in fact, are united by their anti-Muslim sentiments. The police are corrupt and they serve Hindu extremism. This is evidenced by the murder of a teenage Muslim boy who, as he surrenders, is shot dead by the police. On the other side, Sacred Games shows anti-Muslim violence spreading over time across Mumbai, aided and abetted by Gaitonde’s power and money. Cops now stand as a mirror reflection of the outside world and its violent ideologies. There is no “group” dynamic and even Sartaj’s partner Katekar shows Islamophobic tendencies. The “good” cop has been completely isolated. Is there anything progressive in the depiction of the outlier cop or of the police system as a whole? Perhaps the fact that Sacred Games fully acknowledges cop corruption and complicity in political violence can be seen as progress. Cop depictions do not criticize power – they criticize certain manifestations of structural power, one variety of which is policing, and praise the efforts of individual, masculinized vigilantism. But what does this type of narrative enable? These depictions, particularly in Sacred Games, do a lot to justify a kind of vigilantism. They do not criticize power – they criticize certain manifestations of structural power, one variety of which is policing, and praise the efforts of individual, masculinized vigilantism. They imagine the rebellious breaking of norms rather than the establishment of safer forms of society. However, rebellion is the privilege of a few. Rebellion against current police systems does not promise a better structure, one that offers alternatives to policing and violent disciplining as the norm. As Riley has pointed out, it is this kind of rebellious vigilantism that Lee’s movie utilizes to resurrect the myth of the “good” COINTELPRO (Counterintelligence Program) cop and to bypass the reality of 60’s FBI infiltration into radical Black groups. Ultimately, Singh’s rebellion is that of a radical individual who aims to change the status quo in his capacity as a cop, but ultimately cannot imagine a community united by their resistance to the status quo. In other words, the status quo becomes something to be resisted first on a personal level and secondly, by a subject who possesses a status of power and knowledge in the society. The rebellious cop fits the bill perfectly. Sartaj does not take these issues to the media, or make his knowledge of the extreme anti-Muslim sentiments of the other cops known to the public. But it is clearly not a fear of taking life-threatening risks that stops him, because he spends the rest of the show facing incredible dangers as he single-handedly (read, individually) uses his power as a cop (and a male cop at that) to understand the violence around him. Sacred Games ends with Sartaj finding out that religious war is looming. This is not unlike Lee’s explicit references to modern-day white supremacy in BlacKkKlansman, most prominently in the final scene which constitutes a collage of clips from the Unite the White rally in Charlottesville in August 2017. Thus, these films end by coming back into contact with the material world, presenting the crises of white supremacy and right-wing Hindu violence as unresolved and unresolvable within their purview. Their conclusions, at least, show us their failure at providing symbolic resolutions to society’s problems. Sacred Games knows its protagonist’s rebellion is ineffectual for changing either the police or political extremism, and it doesn’t pretend otherwise. Where do we go from here with our collective understanding of the cop?